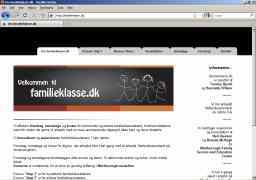 Sylvesterlarsen.dk is a top website, showing the features in KiteCMS. Sylvester Larsen is a Danish rocksinger and the purpose of the site is to get in touch with the fans and promote the new album. The main content of the site is a blog with comments and a rss-feed. In addition to this, there is a guestbook, newletter and a gallerypage, showing pictures from concerts and events with the artist. The music player. 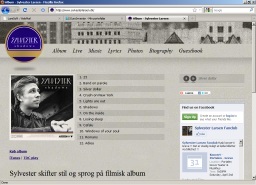 To maintain the continuity in the music, the menu is using AJAX to change page without reloading. Isn't it cool? pilatescph.dk is a stylish website for a certificed Power Pilates studio located in Copenhagen. The website has a webshop with DVD, clothing and booking of classes. Tonus.dk is a Danish company working with Occupational Safety and Health. Babytegnsprog is lead by Line Fagerholt, who is helping parents communicating with their infants before they have the ability to talk using signs. Plukselvfrugt.dk is a guide to places in Denmark, where you can pick your own fruits and vegetables. This website is based on a traditional html flatfile website, which the editor wanted to be able to edit online and to optimize for searchengines. Therefore, the website content was transfered to KiteCMS and now the editor can work with the content without knowing html or webdesign.